The 2nd half of March included an annual scheduled trip to the Sun N Fun Fly in at Lakeland, Florida. 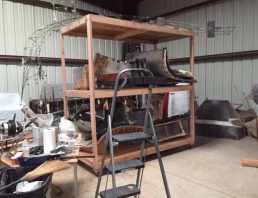 With the hangar move completed at the end of December, there has been a lot of miscellaneous re-organization, cleanup and storage of miscellaneous parts. This has involved some new construction. 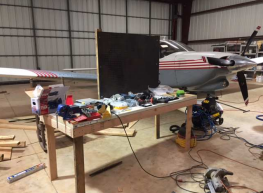 Newly fabricated workbench with vise and pegboard. New rolling shelf unit for large parts. The old 2014 Model has been undergoing taxi tests. The ESC for the engine is being relocated for better cooling. vendor batteries for use for the VTOL engine. Power output now from the main VTOL engine is nearly 3 kilowatts, weighting less than one pound. The Model 2016 is overweight at 17 pounds, and the next model is undergoing a rigorous weight reduction program. The passenger compartment is also undergoing the process of being attached to the ringspar. 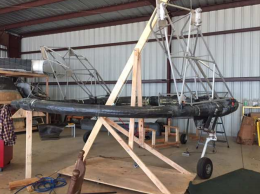 Work has progressed on attaching parts to the ringspar, which is the “backbone” of the aircraft. This figure shows the right midrigger being attached to the ringspar. Fittings for the left midrigger have already been added to the ringspar. This work has progressed slowly due to the many layers of carbon fiber laid up sequentially on the ringspar fittings. 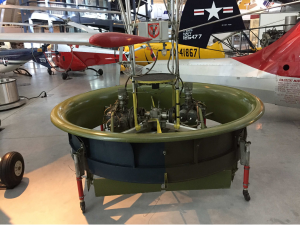 The next steps include final adjustments of the ringspar couplings, and installation of the drive train and its support fairings. Attaching the wings to the midriggers is the next step. The gantry crane is necessary to hold the wings in the proper orientation while the wingroot fittings are mated between the wing root and the midrigger. A 10’ stepladder is on order. 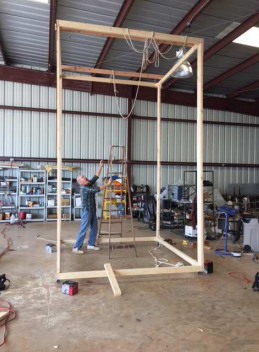 The top wings set almost 10’ off the floor, so the gantry crane is over 12’ tall! Since the wings all up, weigh less than 50 pounds apiece, the gantry crane can be of light construction.